Multiple scenes of Sherman County, Kansas. 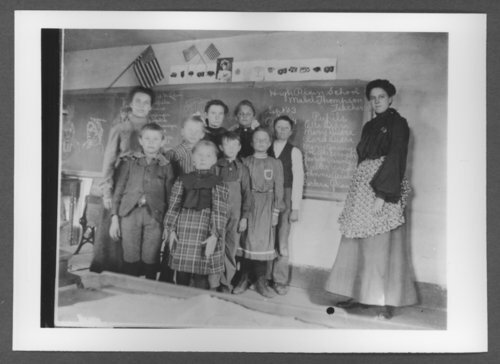 For the photograph of the schoolchildren, listed on the blackboard of pupils are: Alta Didra, Mary Didra, Clara Didra, Mary Geisinger, Joe Geisinger, George Geisinger, Walter Wright, Johnny Geisinger, and Barbara Geisinger. With the teacher listed as Mabel Thompson. Scenes of Sherman County, Kansas - High Plains school, District 32, with Walter Wright, front row on left, for the school year 1903-1904.